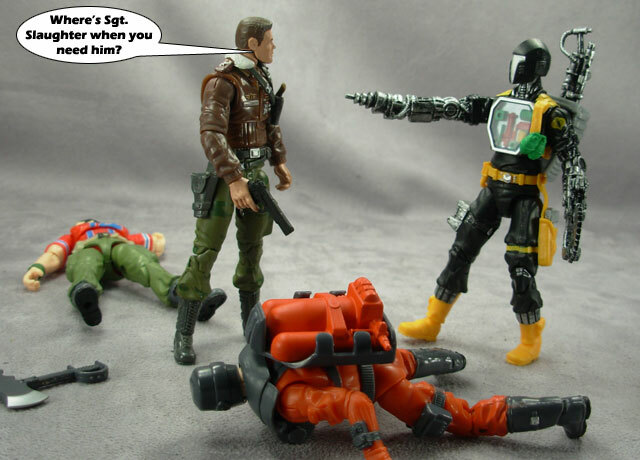 1986 was a year of change for GIJoe; in many ways it was “out with the old and in with the new.” Characters like Stalker, Gung-Ho, and Breaker were replaced with Beach Head, Leatherneck, and Dial Tone and ever-present Cobra Troopers were replaced with the brand-new Cobra Vipers. 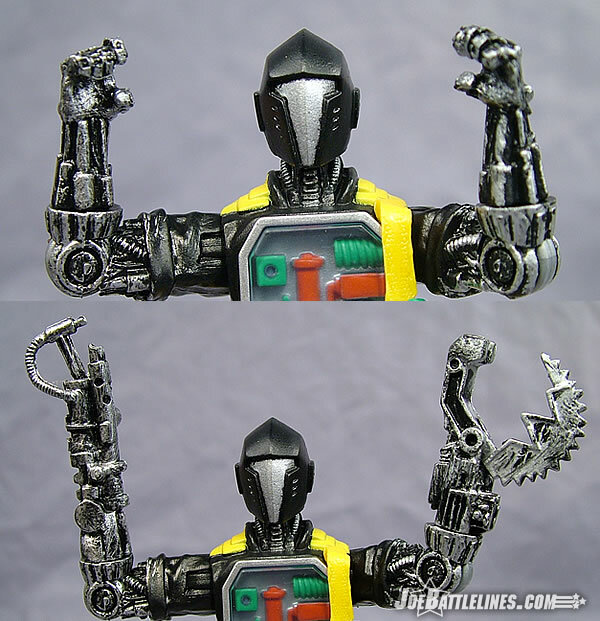 However, there was a shift in the mindset of many toy designers at this time as well in terms of just what made for acceptable cannon fodder for an evil villain. The Transformers were a force to be reckoned with on store shelves but GIJoe was also just coming off of its best year ever. 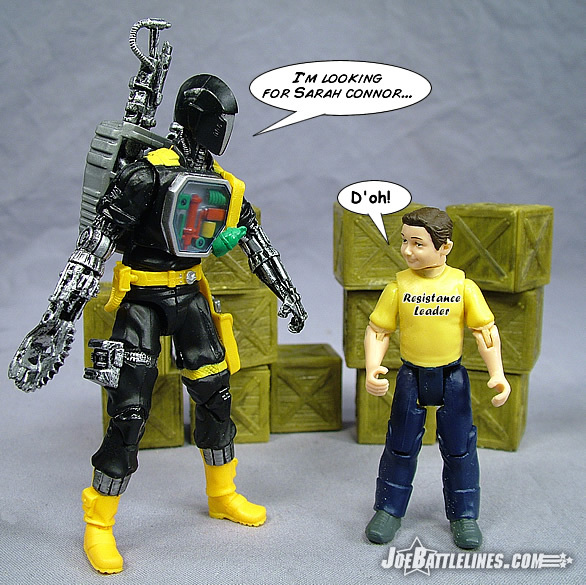 Ever savvy to the changing tastes of children, someone at Hasbro decided that GIJoe could do robots just as well as anyone else and so the BAT concept seemingly was born. 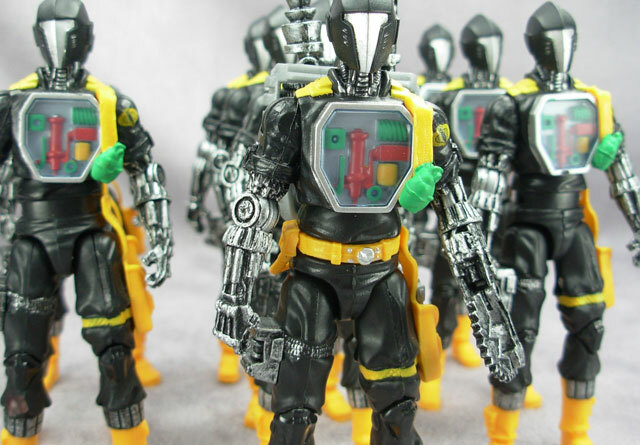 Mindless, mechanical, and able to be shot, blown up and driven over on TV, the Battle Android Trooper were the perfect cannon fodder for a property that could never show human characters being shot and killed. No one cared, however, if a few hundred BATs got blown up every week in the Sunbow animated series and so a toy concept took flight. 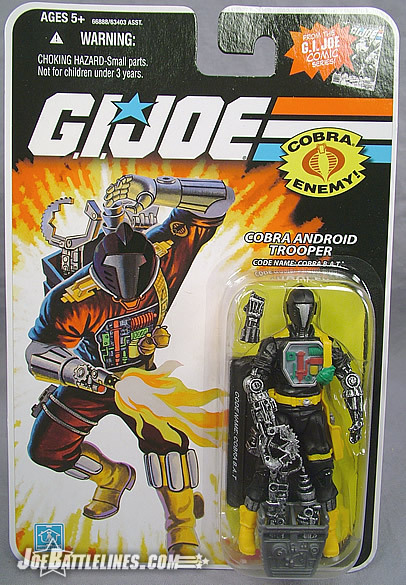 After 22 years, the Battle Android Trooper’s original design is back and, if I must say, better than ever. Like many of the figures released in the “no-ring” style of construction, the inspiration for this BAT model comes from the debut version back in 1986. As with many of the updated anniversary designs, the folks in Pawtucket took the opportunity to keep the design elements that worked on the original and improve those that didn’t. At first glance this new figure is virtually identical to the original v1 BAT—yet even then some improvements are prominent. First off, the head of the BAT has been scaled down significantly giving the robot a much more proportionate aspect. 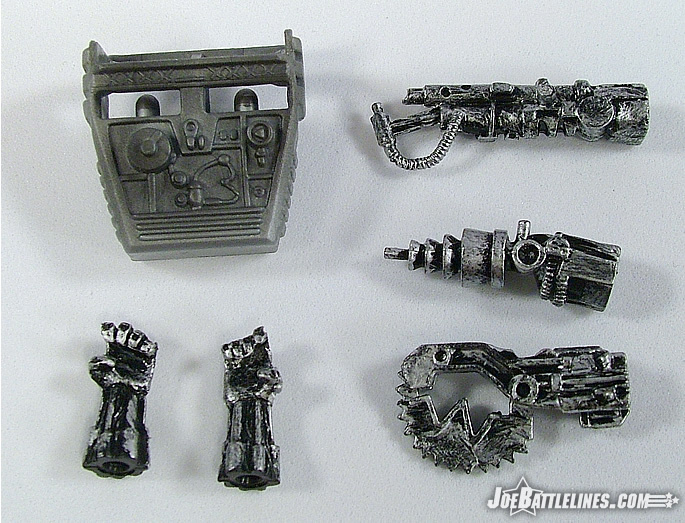 Secondly, the robotic arms are much more mechanical in nature with more pronounced mechanical detailing including a sea of pistols and hydraulics. 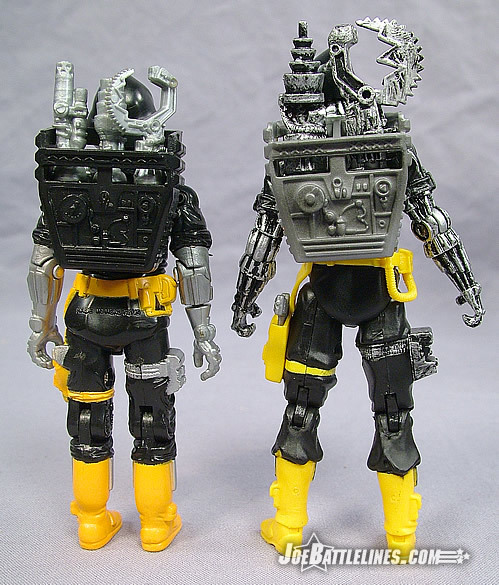 Thirdly, the lenticular chest cover is gone entirely—replaced with a clear plastic panel that reveals the primary color mechanical inner works of this 80’s “mechanoid of death”. Also, the belt, boots, and new sidearm holster are more of a yellow in color than an orange which seems to work quite well for the figure. 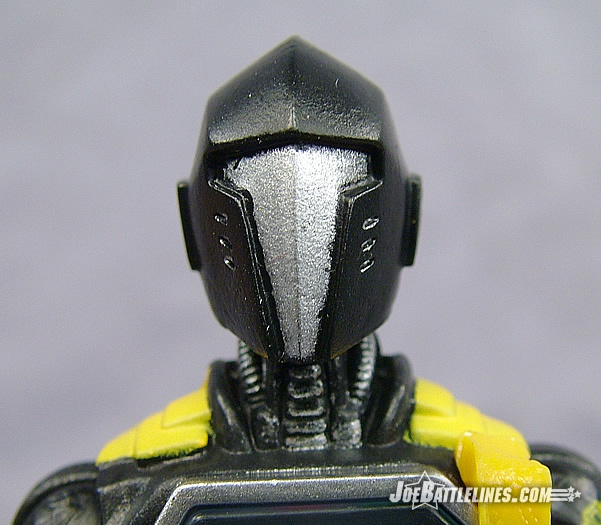 I even like the addition of a much more mechanical neck—covering in similar detailing to the forearms. Honestly, if BATs had looks more like this in the 80’s I’d have been a much bigger fan of the concept. 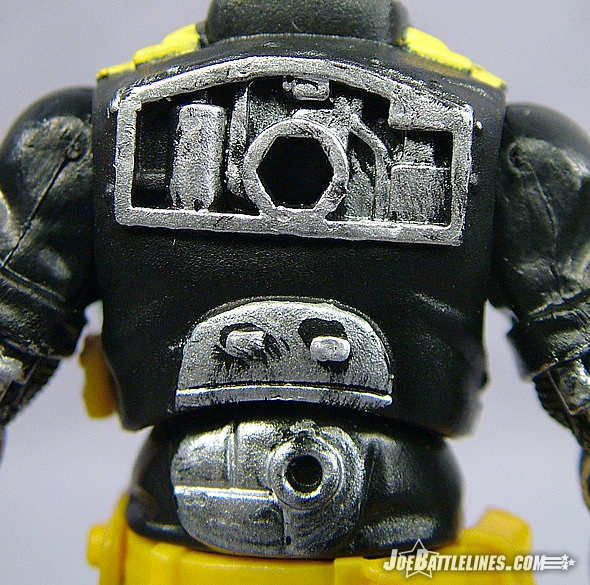 The end result is a much leaner meaner Terminator-esque robot than the original BAT figure. In many ways, I’m reminded of the “Super-BAT” that showed up in the “Malfunction” storyline of the Devil’s Due volume of GIJoe: A Real American Hero. 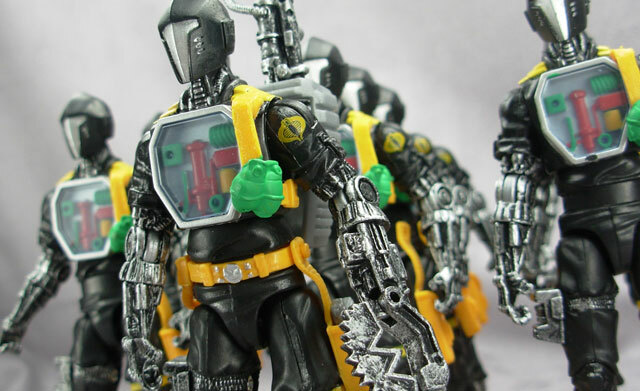 The only downside to the figure’s design is the black paint wash that has been applied over the purely mechanical aspects of the figure’s design. The wash looks good but in some places its almost a bit too much—distracting attention away from the fantastic detail of this figure. Aside from that I’m officially impressed. 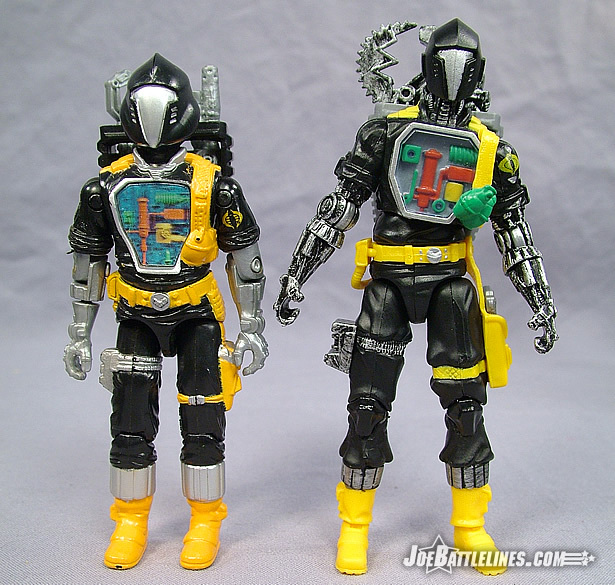 I stated earlier that Hasbro has a penchant for taking classic designs and trying to improve upon them where possible. With regard to the BAT’s accessory kit this statement is 100% accurate. The original 1986 BAT featured a removable right hand and three replacement appendages for a variety of tasks. 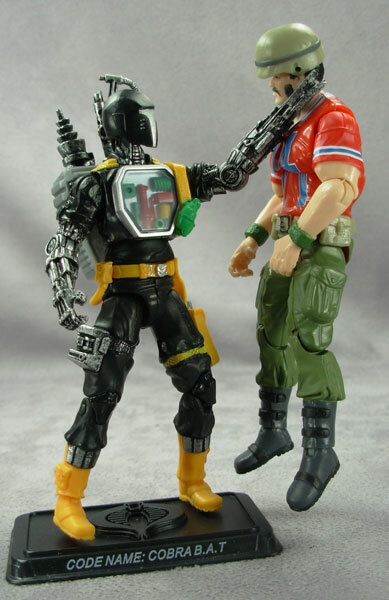 For the 2008 Battle Android Trooper, the team in Pawtucket upped the ante and made both hands removable. For the first time ever, a BAT could shrug off both of its hands and opt for “deadlier digits” with which to carry out its instructions. 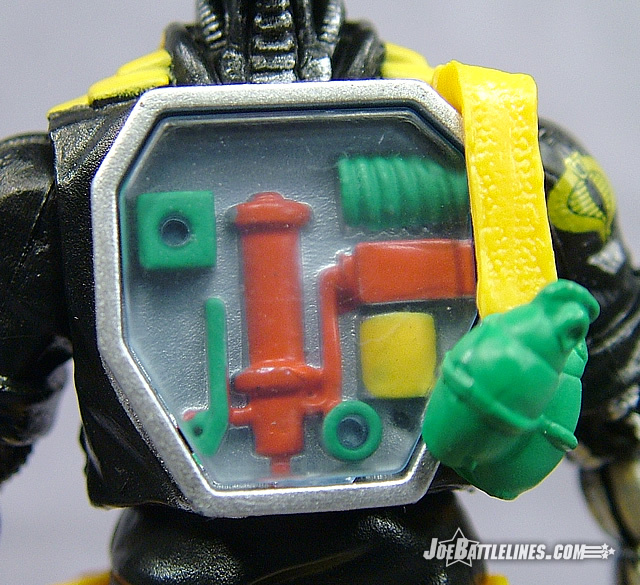 Hasbro has included three accessories once again (even though the backpack only holds two) – all of which are updates of the classic gear. 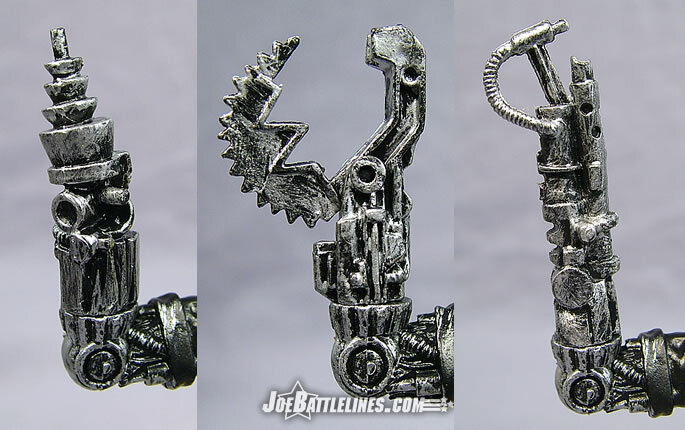 A flamethrower, laser cannon, and a tearing claw around out the accessories giving this BAT two chances to wreak havoc upon the Joes and their allies. Not only that but the accessories now attach to a flanged post on the figure’s elbows ensuring a much more snug fit than the original BAT was able to maintain. While the attachments might come off a bit hard at first, they stay on once they’re place onto the figure’s arms and that’s what counts. Seriously—I’m impressed as the Hasbro’s recent attempts to replicate the success of the original BAT concept have been less than impressive. This figure, however, not only takes the cake but rips it to shreds and lights it on fire! 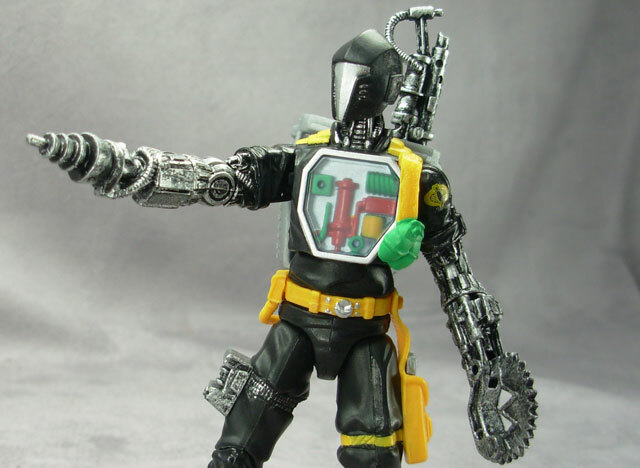 Up until recently the 2008 wave 5 Iron Grenadier Destro was hands-down my favorite figure of the 25A era. It was a solid design that was both functional and visually appealing while also remaining faithful to the original character design. This Battle Android Trooper has single-handedly (or “single clawedly”) dethroned the Laird of Castle Destro as my favorite figure in this entire “no-ring” line. In my opinion, Hasbro will be hard-pressed to top this figure and many fans already seem to agree. In the three times that I’ve spotted this wave at retail not a single BAT was to be found. 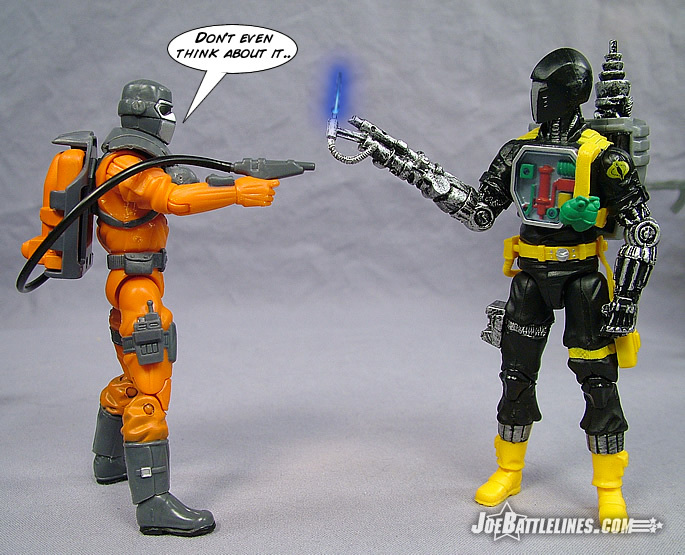 (If only the same could be said of both Buzzer and the Cobra Viper—those two are choking the pegs around here.) If Hasbro was to produce the perfect troop-builder in this new line, the BAT is it! I’ve already stated that I’m not really troop-building the new 25A figures like I did with the GvC era figures and yet the BAT actually makes me rethink that decision somewhat. (Granted it also could be the simple fact that if it weren’t for madmac41 I wouldn’t have this figure! Thanks Scott!!) Of any figure in this new line, this is the one that I would honestly recommend to ALL GIJoe fans. It’s a shining example of what Hasbro can do with a properly thought-out and well-executed figure design!